Former colleague Jahnnette graciously allowed me to put a sign in her yard. 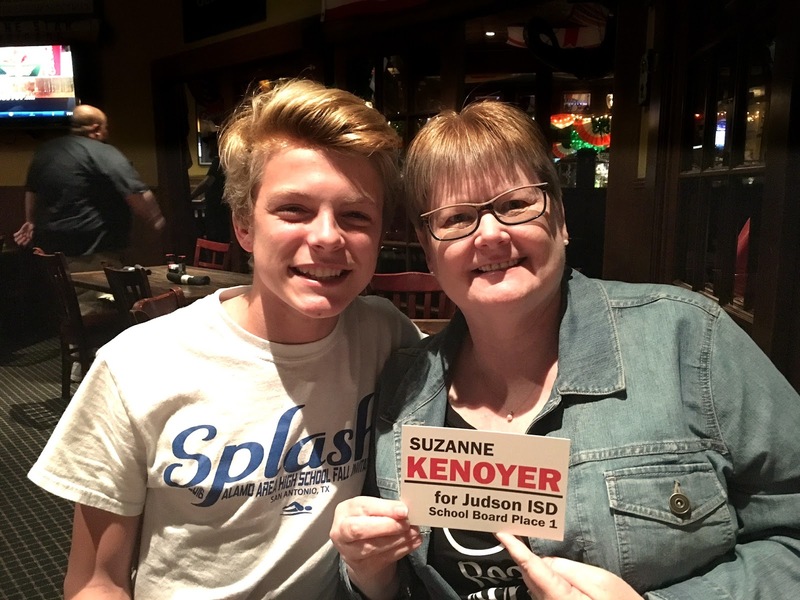 Retired JISD counselor Christy is backing me and I've got the golden retriever vote, too! Thanks, Boomer and Oakley! Former student Conley was kind enough to pose with me. Thanks, Conley! 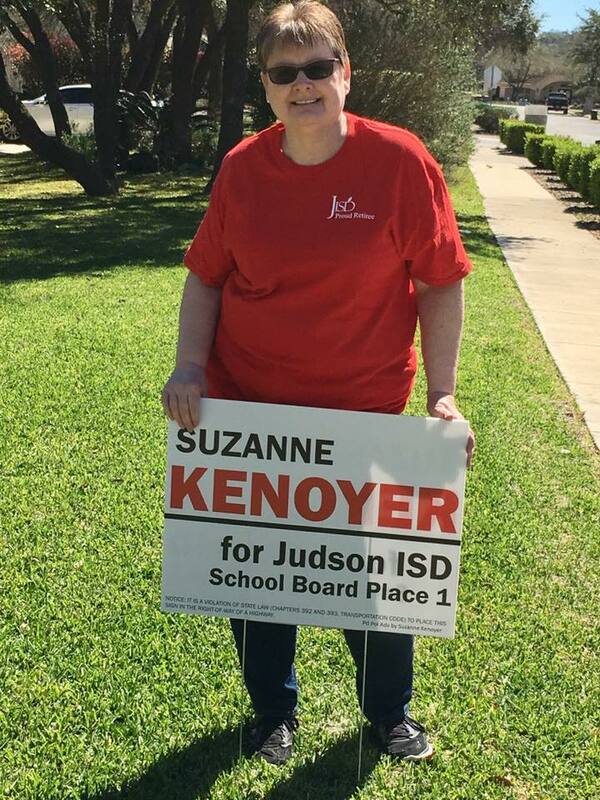 Dear friend and Judson teacher Daliene is knocking on doors and asking people to vote for me. I really appreciate all your help, Daliene! 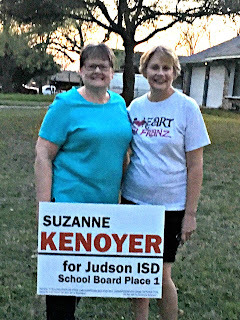 Retired JISD teacher and former colleague Diane allowed me to put a sign in her yard. Thanks so much, Diane! Retired JISD teacher Liz and her husband asked for a sign for their yard. Fun fact: Liz and I went to high school together and met up again years later when we were both doing 6 Traits of Writing training for Judson teachers! 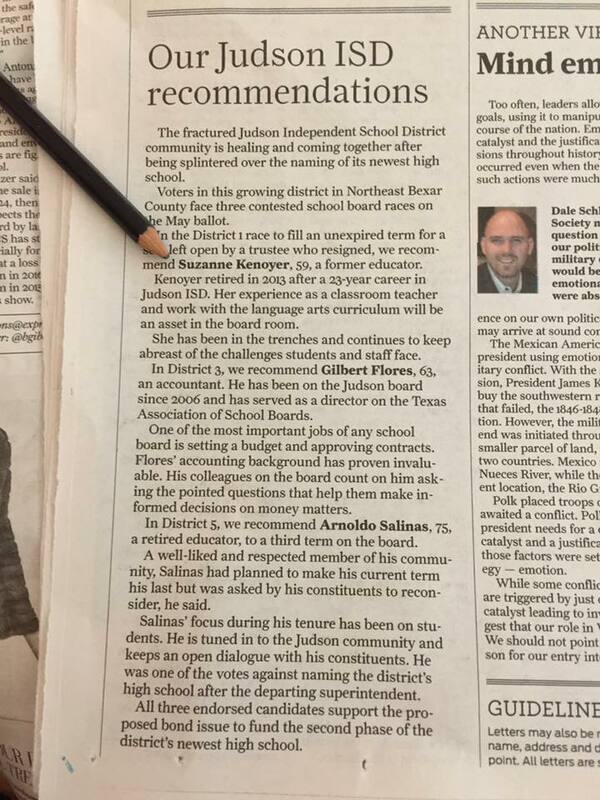 I am happy to announce that the Express News has endorsed me for Place 1 in the Judson ISD Board of Trustees election. You can read the article here. The bond issue to complete Veterans Memorial High School will be on the ballot May 6, along with the school board election. JISD is holding 2 forums to answer any questions you might have regarding the bond. There will be one at Kitty Hawk Middle School on Wednesday, March 22 at 6:00 and another on Wednesday, March 29 at 6:30 at Veterans Memorial High School. I plan to attend both. Please come say hello if you attend! Watch For My Signs in Your Area! Meghan is a JISD teacher and a former colleague. She and her Hubs are rooting for me! Thanks so much for the support! 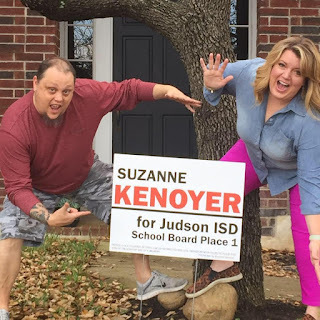 Retired Judson teacher Jennifer says she's got my back! Thanks for your support, Jennifer! Dropped off a sign in Live Oak. Sherlyn is a Judson music teacher and a former colleague. Thanks for the support, Sherlyn! I've been able to purchase campaign signs thanks to all my wonderful supporters. 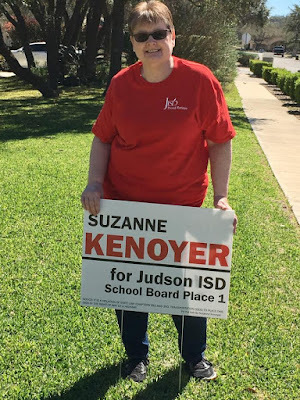 If you live in my district and would like to display one of the signs, send an email to suzannekenoyer@gmail.com with your address and I'll bring one by! I got a little mention in the local newspaper today, the Northeast Herald. We are 12 weeks away from Election Day! The response to my candidacy for school board has been amazing. I am so grateful for all of you who think I would do a good job at working for our kids. Now comes the hard part - asking for your help. I expect to have at least one opponent in this race. That means I will need to do a good deal of campaigning, and that costs money. It's very difficult for me to ask for money. But my teacher retirement pay only goes so far. Signs, fliers, stationery - they all cost money. If so, you can donate very easily right here on the blog. Simply look to the right for the Donate button. Click on it and it will take you to Paypal, where you can donate. You do not need a Paypal account to do so. You can select "Pay with a card," and your credit card will be charged without your having to open a Paypal account. I would be so very appreciative of any help you can give. 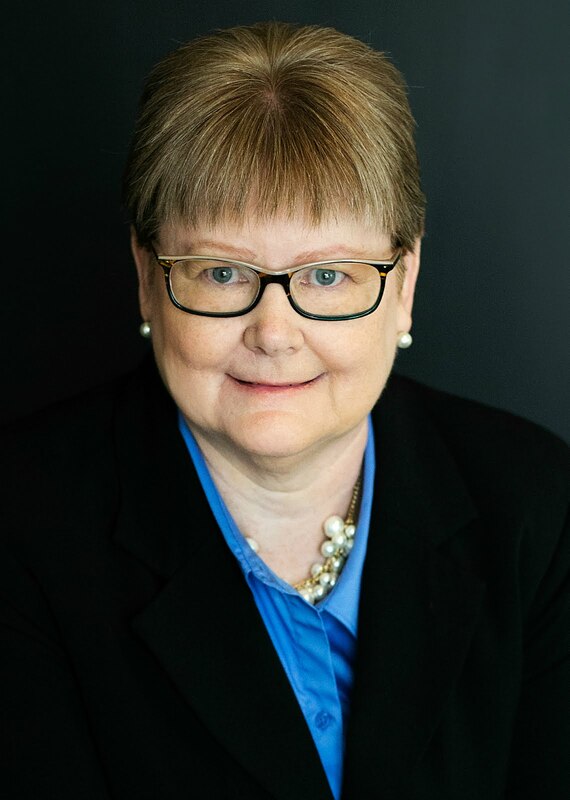 Click below to help me in my campaign. (c) Suzanne Kenoyer 2017. Simple theme. Powered by Blogger.